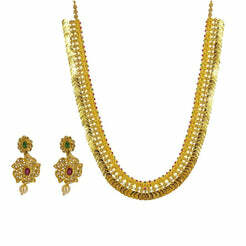 22K Antique Gold Finish Necklace & Earrings Set in Floral Pattern W/ Emeralds, Rubies, & Kundan for women. 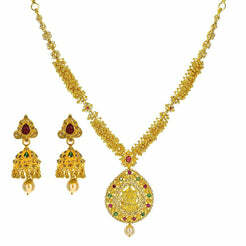 Necklace features crecent moon frame with handcrafted filigree set with stunning multiple precious gems. Matching dangle drop earrings feature a screw back closure. 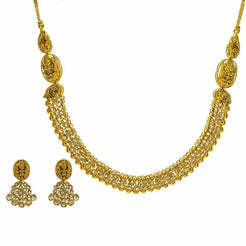 This beautiful set is perfect for special occasions. Total weight is 8.14 grams.